Better Pak has you covered for all of your bag needs. From anti-static poly bags, flat poly bags, re-closeable poly bags all the way to auto fill bags, all of your needs will be filled. When it comes to poly bags, quality and consistency are very important. All the bags on this website are stocked in our Better Pak warehouse. 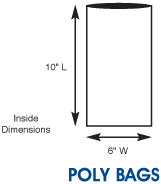 Our layflat poly bags are manufactured with an extra strong bottom seal or a durable side weld. 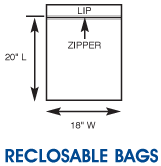 Our gusseted bags are manufactured with tubular construction. Poly tubing is manufactured and wound flat or gusseted. Our poly bags are premium, heat sealable bags. These flat poly bags are excellent for storage or keeping your items clean and protected from moisture during shipping. They offer good strength and industrial clarity. We offer hundred s of sizes, if you have any questions please give us a call at (818) 884-2406 and one of our specialist will be able to help you out. A "MIL" equals one thousandth of an inch and measures the thickness of the bag. 1 MIL Lightweight protection for temporary storage. 2 MIL Most popular thickness for shipping parts, clothing or protecting food. 3 MIL Added protection for parts and hardware. 4 MIL Heavier protection for industrial parts and tools. 6 MIL Protects against punctures and tears. 8 MIL Super heavy weight bags for maximum strength.